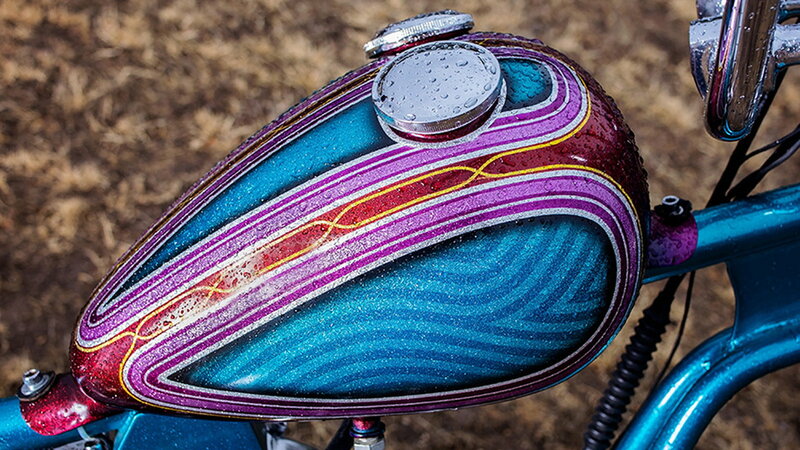 Daily Slideshow: 1970s inspired Ironhead chopper build with psychedelic charm. Somethings take time to get right. Owner Hank Doss built his period-correct chopper from an Arlen Ness Lowrider frame that he had been holding onto for twenty-odd years. 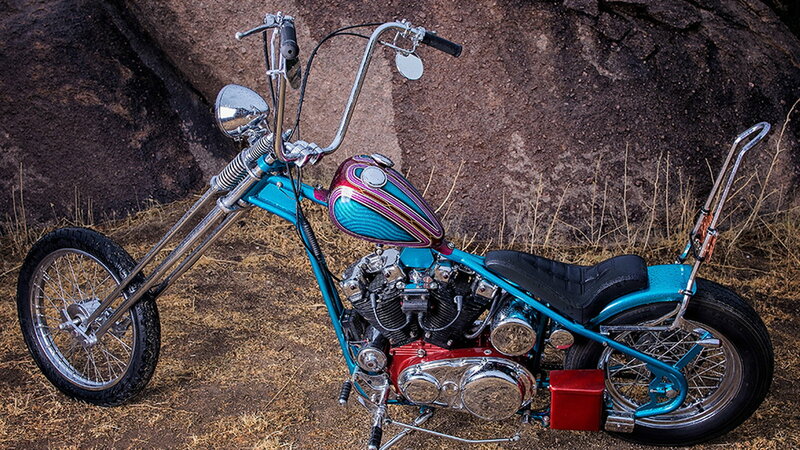 The result was 'Glitterbug,' a metal-flaked, goosenecked, 1969 XLCH Ironhead chopper. With its laid-back stance and far-out paint job, Glitterbug is bound to put a smile on your face. Hank Doss is a vintage chopper fanatic. Like any dedicated aficionado, he has collected bits and pieces over the years. His hard work and attention to detail are evident in this latest build. Glitterbug is an old-school classic. From its 45-degree raked gooseneck frame and apehanger handlebars to the crazy geometry of the sissy bar mounts, this chopper just needs a time machine to transport it back to the late 1960s. 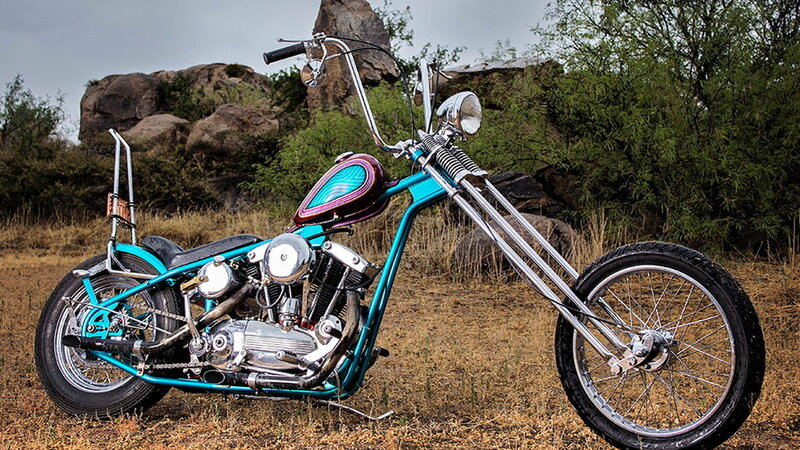 >>Join the conversation about this Ironhead chopper right here at HDForums.com! Cradled in the modified Arlen Ness frame is a 900cc 1969 XLCH Ironhead motor with a set of Taylor Pro Wire spark and ignition cables. The 'CH' or 'Competition Hot' model was introduced in 1958 and the designation remains to this day on factory-custom Sportsters. Keen observers will note the left-hand brake set-up. Up until new federal regulations in 1975, all Sportsters had right-hand foot shifters like their British counterparts. A twelve-inch over, AEE Springer sticks way out up front. 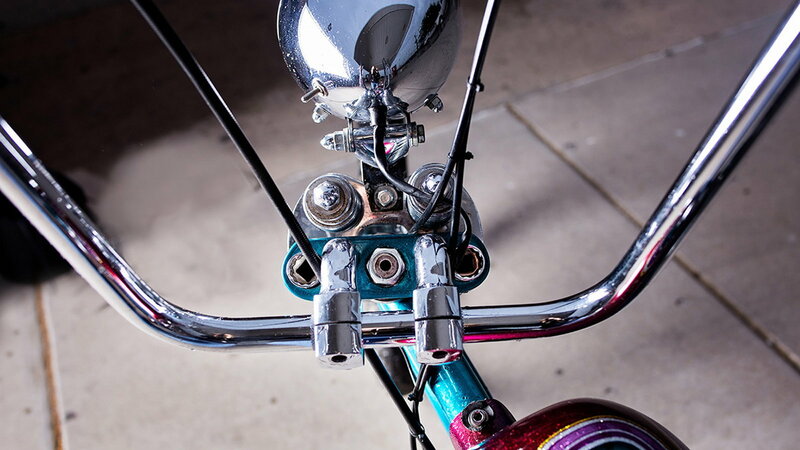 Produced at some point before 1975 at the legendary California-based A.E.E Choppers, the frontend is a reminder of a time when the chopper industry was booming. Topped with a Bates-style headlight and attached to a set of apes, the frontend set-up is as minimal as it gets. Of curious note is what appears to be twelve-point sockets covering the triple tree nuts. Glitterbug rolls on a classic combination of 19-inch spoked front rim and a 16-inch rear clad with Dunlop Elite tires. 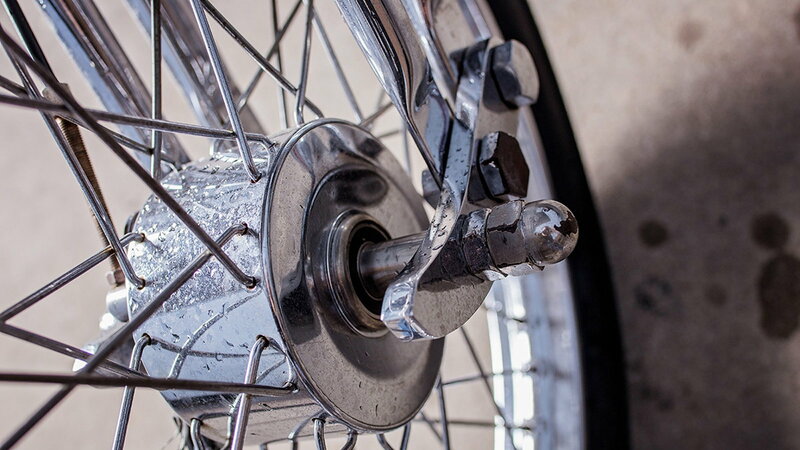 With the stopping power of bicycle brakes, a cable actuated Mini Drum Brake fulfills legal requirements out front. Rest assured, the majority of the braking duties are handled by a mechanical rear drum brake. 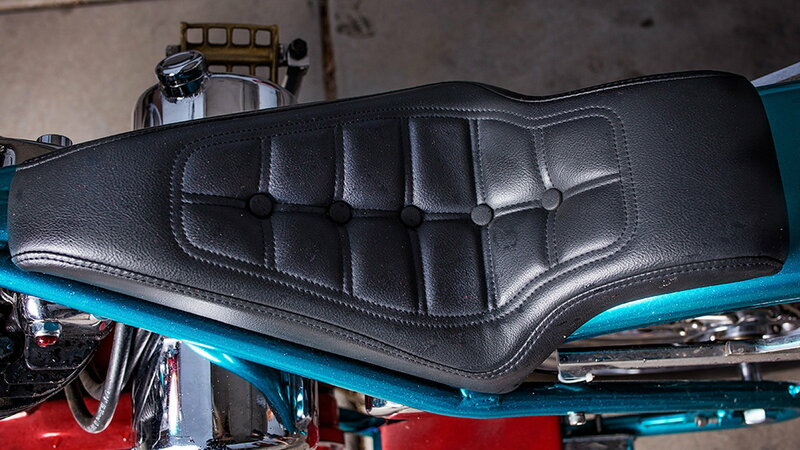 In business since 1968, Drag Specialties was the source for the Scorpion Low Rider Seat. Specifically designed for custom hard tail frames, and unchanged from its original design, the Scorpion seats are the perfect match to any retro chopper build. The leather Drag Specialties seats also feature a thick aluminum base with a carpeted bottom to preserve the paintwork. The crown of any chopper build is the gas tank and paint. 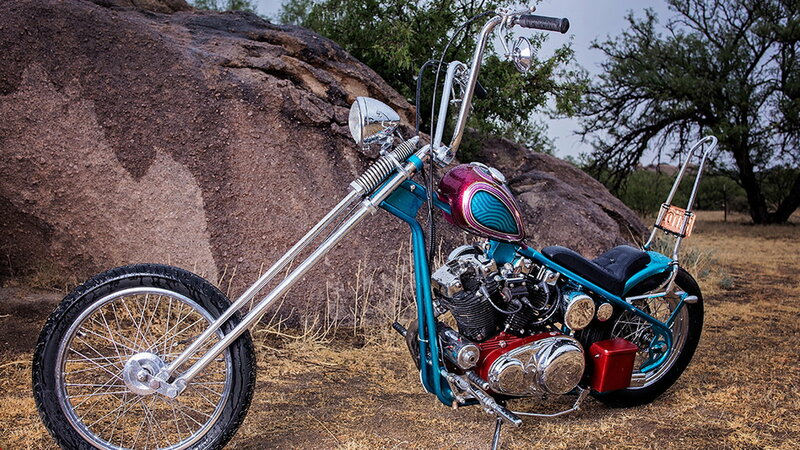 Going by a few names such as 'Axed,' 'Wasp,' or 'Alien,' the double-capped tank is the perfect fit for this chopper build. Now available from a variety of custom manufacturers, the design originated from early chopper builders who cut and welded together stock five gallon Harley Davidson tanks to achieve a streamlined look. Glitterbug is an exercise in balance. The stand-out red of the engine cases and battery box are calmed by the glitter-blue paint spread across the whole frame. 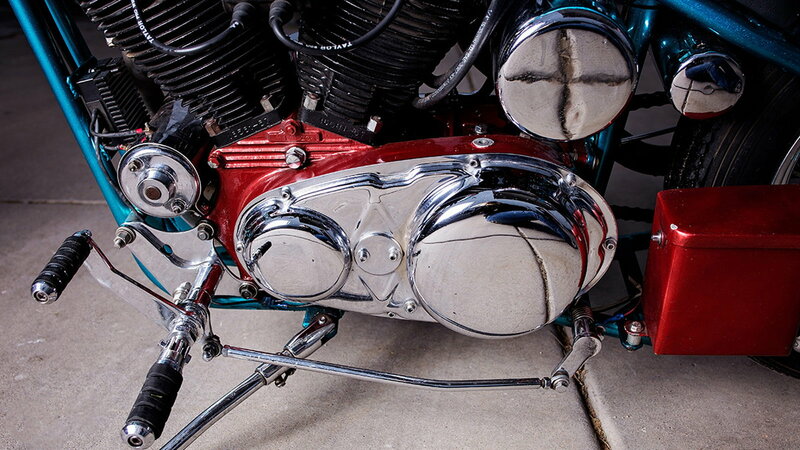 The awkward geometry of the frontend and bars are quieted by the business-like Ironhead engine and rigid rear. Glitterbug is a great example of psychedelic-era of chopper building. Unlike some crazy designs, this chopper still looks rideable, and that is bound to make anyone smile.